Every month, more than 30 million Americans visit online dating sites in search for a potential date or life-long partner. As online dating numbers climb, a proliferation of online dating scams seek to separate online daters from their cash. 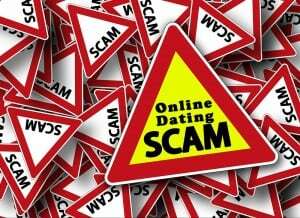 Because of this, the FBI has issued a warning to spread the word – online dating scammers and criminals use online dating sites too. And they are targeting millions of online daters with a variety of scams. The most typical of scams is being contacted by a potential interest who claims (sometimes immediately, sometimes later) that he/she is an American either traveling or working outside of the United States. They send photos, messages, emails, and sometimes even talk on the phone. Their goal is to develop a “relationship” with the user in order to effectively execute the scam. They communicate for weeks or months and when they feel the user is “falling in love,” the scam begins. An “emergency” will suddenly occur and they will need money from you. The scam is highly effective because they took the time to foster a relationship with the user before asking for money. Thus, victims find themselves thinking with their “heart” instead of their brain. When a victim sends money, the scam continues. New “emergencies” arise and more money is requested. Thousands of people have lost their entire life savings to these effective scams. According to the FBI, all online daters are at risk. However, the most common online dating scam target is women who are over the age of 40 and divorced. > Asks for money for a variety of reasons (travel, medical emergencies, hotel bills, hospitals bills for child or other relative, visas or other official documents, losses from a financial setback or crime victimization). Never send money to anyone you met online. The FBI says that your chances of getting that money back are slim to none. If you think you have been the victim of an online dating scam, then be sure to file a complaint with our Internet Crime Complaint Center (www.ic3.gov). The FBI recommends using established and reputable online dating services. Joe Tracy is the publisher and founder of Online Dating Magazine, which launched in July 2003 and has been providing original dating advice, tips, articles, reviews, and videos to readers ever since.